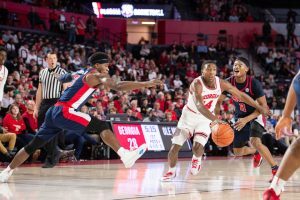 Ole Miss Men’s Basketball out-rebounded the SEC’s best rebounding team on the way to a big win over Georgia on Saturday. The Rebels moved to 16-7 (6-4) after defeating a sloppy Bulldogs team 80-64 on the road. With the win, the Rebels finish the week 2-0 after four losses out of their five games preceding Georgia. The win in Athens marks the first time the Rebels have won in Stegeman Coliseum since January 2012. Winning on the road isn’t easy, but the Rebels handled their business versus a Georgia squad that has now lost four games in a row. The fact that the Rebels had control on the road in an SEC clash speaks volumes about the team’s maturity. After trailing by as many as eight points early in the first half, the Rebels found some separation courtesy of a couple big runs. The Rebels’ big three, Breein Tyree, Terence Davis and Devontae Shuler, propelled Ole Miss to a 10-0 spurt en route to their first lead of the game at a score of 22-20. The Rebels didn’t let up in the second half. Through a combination of key stops and a collective effort at attacking the glass, Ole Miss cruised to a 16-point victory. Ole Miss won the rebounding battle 38-32 against a Georgia team that ranks No. 1 in the SEC in rebounds. Kermit Davis said the Ole Miss big men have lacked in effort during the past few games, but Bruce Stevens and Dominik Olejniczak showed up on Saturday. Stevens came down with nine boards, a team high for the Rebels. Tyree matched his career high with 31 points on 11 of 22 from the floor, including conversion on 3 of 8 from downtown. Tyree eclipsed the 1,000-point career mark in the win and extended his streak to five games with 20 or more points. He is now the first Rebel since Stefan Moody to score 20 points in five straight games. Hinson dropped 13 points on four of seven shots. Most of his damage was done from beyond the arc, and he made three of five shots from the three. Terence Davis chipped in 12 points and five rebounds, and Shuler finished with eight points along with seven rebounds. Next up for the Rebels is a road trip to Auburn on Wednesday, when the Rebels will have an opportunity to add another marquee win to their resume. The Bruce Pearl-led Tigers have bounced in and out of the top 25 all season and currently stand at 16-7 (5-5) making the matchup all the more significant when it comes to making ground in the log-jammed SEC.